Just above the old sanatorium, where we recently stayed, is the old gold-mining town of Hamiltons. Gold was discovered there in 1863 on James Hamilton's sheep run. Within a year there were 3000 miners, five bakeries, three doctors, two banks and a newspaper. Today there is no more than a deserted hillside. Several years ago we made our way over a dry weather road to visit the site of the town. It is set high on a gently sloping hill over looking the Maniototo. The view was beautiful, and a little haunting as I could see no signs of this bustling town. Early in the 20th Century the buildings were removed to Waipiata and Ranfurly. Waipiata, which means 'clear water' is a small town at the bottom of the hill and is now known for its hotel - a popular stopping point for cyclists on the rail trail. But once it was a busy little town with a canning factory for rabbit meat. In its heyday upwards of 5000 rabbits were processed per day. Which is a fine indicator of the rabbit problem. In my 'Amelia' novel there are several thousand stoats aboard the ship she arrives on. These were hoped to combat the rabbit problem. Instead they became a problem themselves. While rabbits continued to destroy the land, stoats set about eating our flightless native birds. To fill in the gaps for those of you who are unfamiliar with our history, when the first British settlers arrived they brought deer and rabbits with them for sport and food. Unfortunately they thrived in our environment and quickly became a problem. The settlers also brought: gorse for hedging, which now runs riot, hedgehogs, sparrows, blackbirds, thrushes, starlings, and willow trees which now line all our rivers. There are many more species to add to that list, I'm sure. One day I plan to look into to it more deeply. This visit, as we were unable to visit Hamiltons, we travelled up on the other side of the gully to the Hamiltons cemetery. This is beautifully kept and surrounded by a well crafted stone fence. Perched on a hill, it also overlooks the plain below. I find cemeteries fascinating places to visit. The names of all the inhabitants of a particular town, the relationships, ages and causes of death are both sad and interesting and many a gravestone has inspired me to write a story. 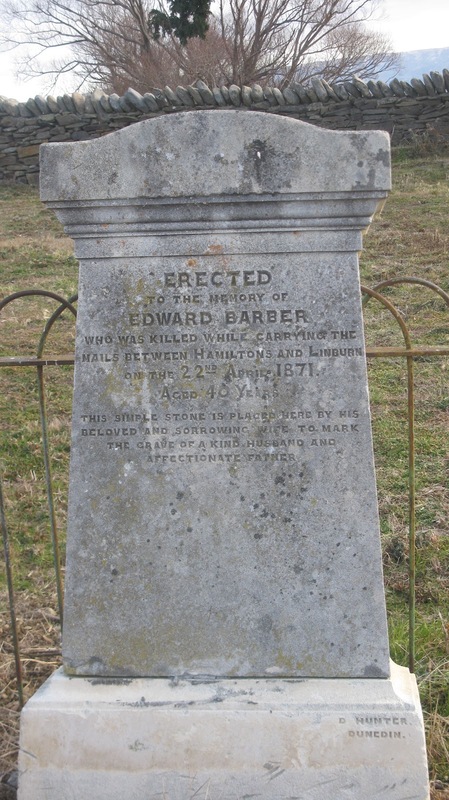 There was one gravestone in particular at Hamilton's that piqued my interest. 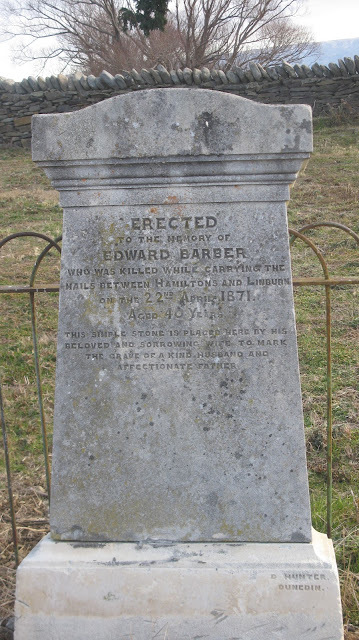 Edward Barber, 40, was killed in 1871 while carrying the 'nails' between Hamiltons and Linburn. Was it nails or mails? Mails makes more sense but it looks like an 'N'. The inscription is one of the most touching I've come across. For the more visually challenged I'll rewrite it here. "This simple stone is placed here by his beloved and sorrowing wife to mark the grave of a kind husband and affectionate father." This shot is looking out of the cemetery between what must have been two huge pines or macracarpas. Looking back to the hills with the cemetery behind me. I just love the brown and barren hills in this part of the world. 'Down The Years In Maniototo' by Janet C. Cowan - 1948. Love this! Lots of information. The third photo down is a great photo - looks painterly!